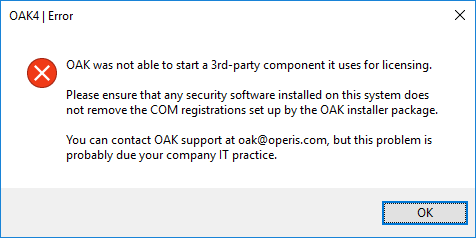 OAK is a COM add-in, and the 3rd party licensing component it uses, is a COM component. These require COM registrations, which the OAK installer does when it is used to install OAK. •Displays an error message saying "OAK was not able to start a 3rd-party component it uses for licensing"
If you encounter either of these problems, you need to ask your organization's IT staff to make sure that the COM registrations that are set up by OAK's installer package do not get removed by security or system maintenance software, or by them when they repackage OAK for your IT environment. See the section titled OAK Registry Settings for details of some of these COM registrations.